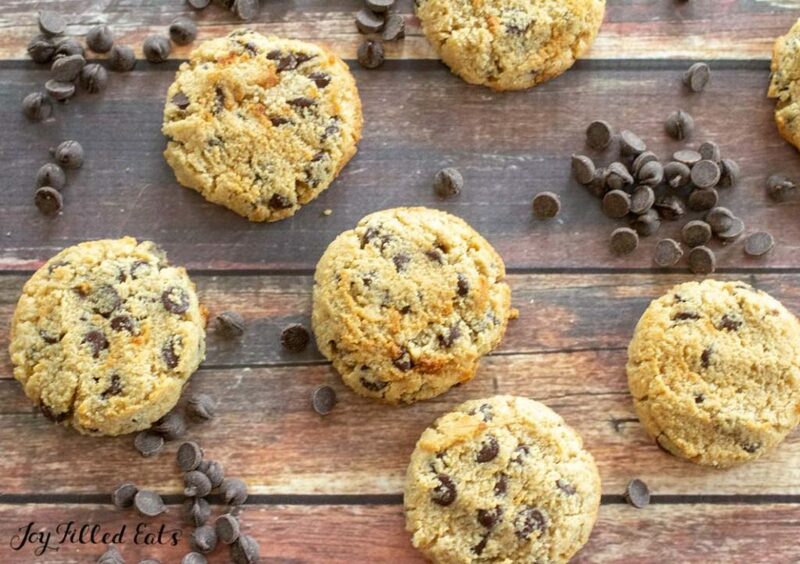 Need a recipe for Eggless Chocolate Chip Cookies? You’ve come to the right place! These eggless cookies are just as good as traditional chocolate chip cookies and a lot healthier. I really began making eggless cookies as an accident. A friend mentioned to me that she used gelatin in place of eggs to make almond flour cookies crisp and I had to give it a try. After a few trials I came up the perfect almond flour cookie dough and since then I’ve used it in a dozen different recipes. By switching the flavor of extract, adding some nuts, and adding chocolate you can change the taste. With different shapes, you can change the look. It is easy to make 3 or 4 different types of cookies with the same base dough. And no one will ever know. 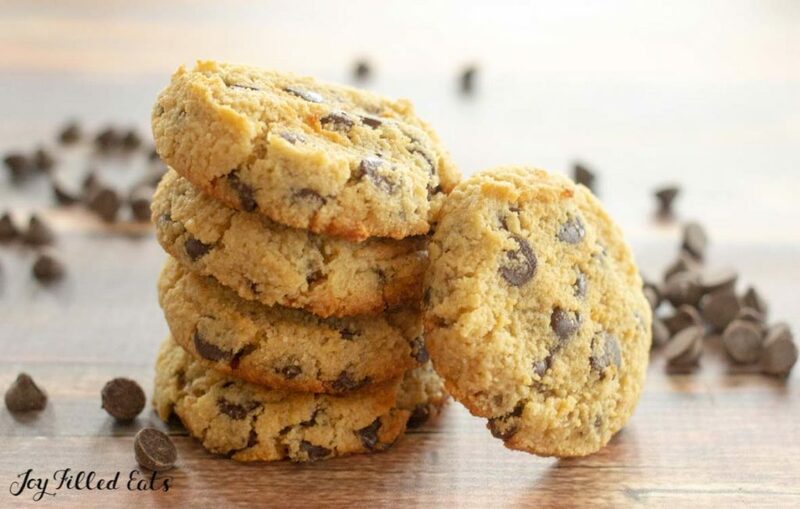 This recipe is very similar to my Chocolate Chip Shortbread Cookies with a couple tweaks to make these eggless chocolate chip cookies taste more like the classics. I make my cookies in my food processor. 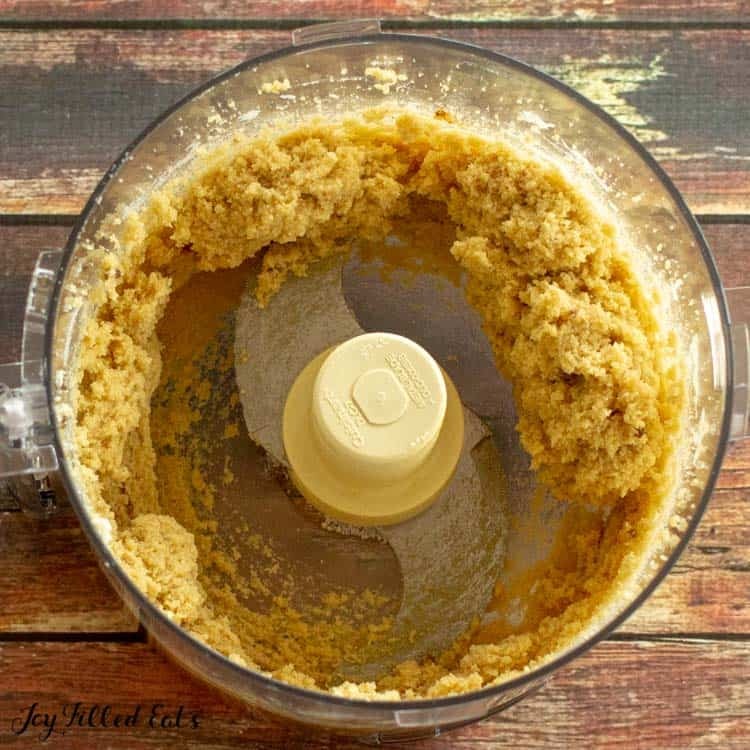 The food processor cuts the cold butter into the flours easily and mixes all the ingredients thoroughly. Then I stir in the chocolate chips and scoop the cookies onto a cookie sheet lined with parchment paper. This method is quick and painless. If you want to make another batch of my eggless cookies you don’t even need to clean the food processor bowl in between. 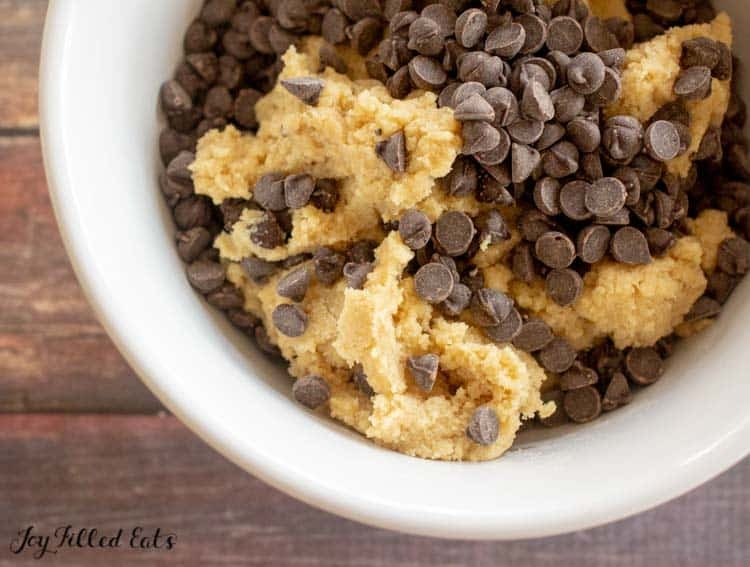 One of the best parts of making eggless chocolate chip cookies is that you can eat the cookie dough without worrying about consuming raw eggs. I’m a bit of a rebel and use raw egg yolks in most of my ice cream recipes (and I’ve never gotten sick from eating homemade ice cream) but I know this is a concern to a lot of people. 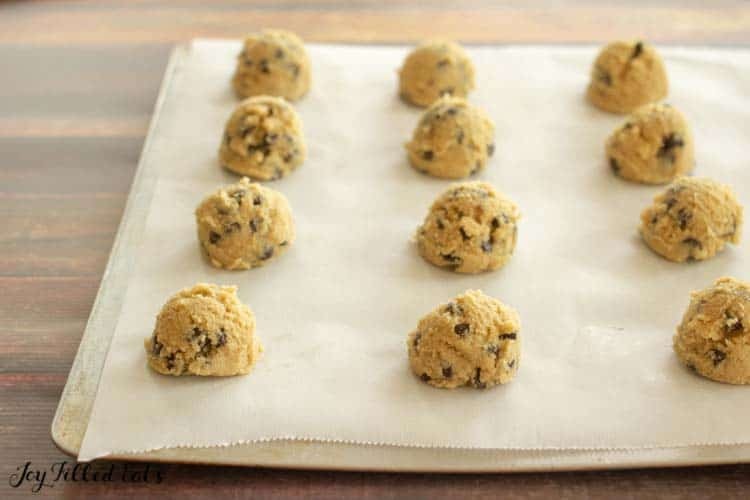 Eggless cookie dough is a delicious treat and I use it as a base for my Chocolate Chip Cookie Dough Cheesecake and Frozen Cookie Dough Bites. The easiest way is with a cookie scoop. My three cookie scoops are one of the most used gadgets in my kitchen. I use the largest size to make meatballs, giant cookies and fill cupcakes, and the smaller sizes for cookies and to scoop ice cream. My toddler loves having baby ice cream cones. My local grocery store sells mini cones that are perfectly sized for a toddler. I use the smallest scoop and give him a little ice cream as a treat when the bigger kids have dessert. You need the gelatin. Since these don’t have eggs the gelatin is the binder. I have only tested these with my sweetener and these exact ratios of almond flour and coconut flour. Using a different flour blend will result in a cakier cookie. Use chocolate chips you like. If you don’t like the sugar-free chocolate chips go ahead and chop up a bar of sugar-free milk chocolate instead. Here are all of my recipes for Eggless Cookies! 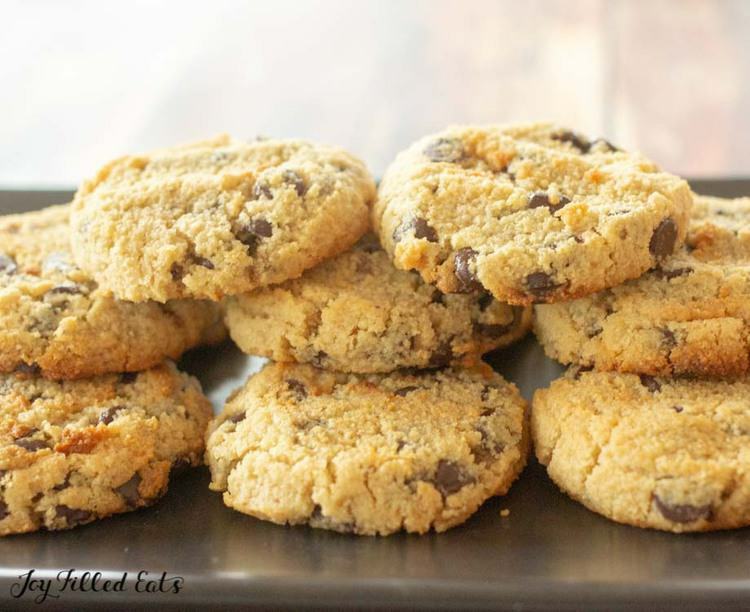 I hope these Eggless Chocolate Chip Cookies are your new favorite treat! 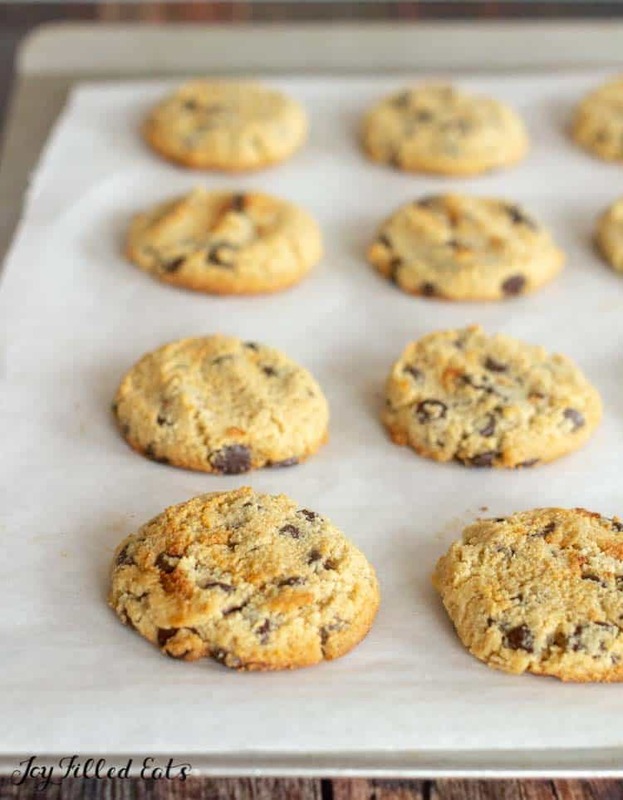 Need a recipe for Eggless Chocolate Chip Cookies? You've come to the right place! 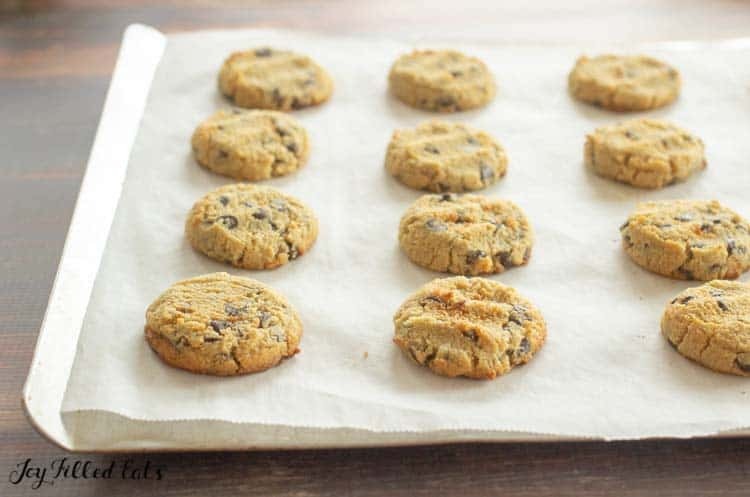 These eggless cookies are just as good as traditional chocolate chip cookies and a lot healthier. Combine the dough ingredients (not the chocolate chips) in the food processor and process until the dough comes together in a ball. This takes about a minute. Put the dough into a mixing bowl and stir in the chocolate chips. 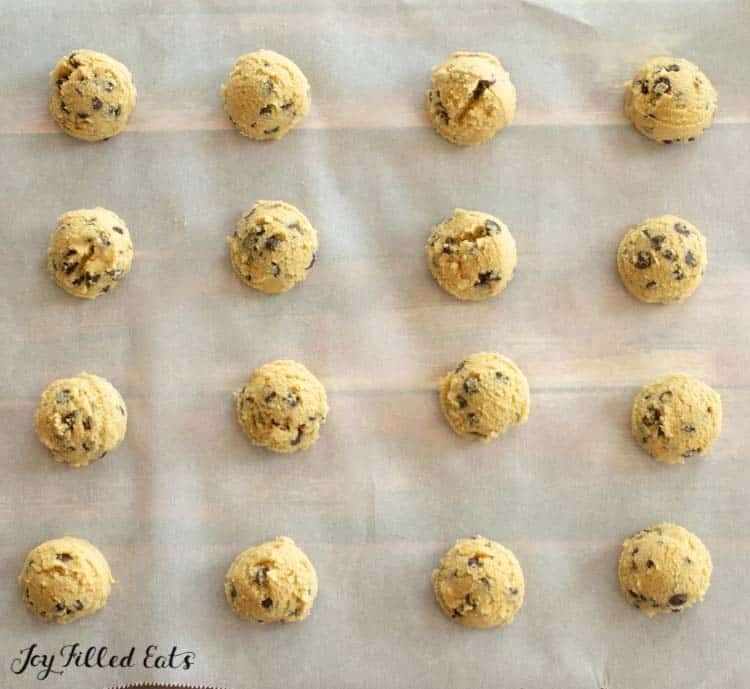 Divide into 18 balls and put on a parchment-lined baking sheet. Press down with your fingers. Bake for 15 minutes or until firm to the touch and golden around the edges. *** I get a lot of comments from my low carb readers on the use of molasses. I use it for flavor, not sweetness. One teaspoon of molasses has 5 grams of carbs. This recipe uses 1 tsp divided by 18 servings. That is less than .25 grams of carbs from the molasses. If you prefer you can just omit it. I used 1/3 cup granulated Swerve and 1/3 cup Swerve Brown, used chopped up 77% dark chocolate bars, and these came out fantastic! Definitely the closest I've had to a "normal" cookie! These were amazing!! The texture was very cookie like! I made them for a small get-together with a few families with kids. I also made a double batch of a higher end brownie mix for those who didn't mind sugar. I was hoping that with the brownie option I'd have leftovers for me. However when everyone left I noticed the platter was empty. 😞 I don't have a food processor so I chopped the butter up in small pieces. Then I used a mixer to begin combining. I ended up using my clean hands to knead it into dough. Another reason I liked them is that my cookies actually looked a lot like your photos. That generally doesn't happen with online recipes! I am definitely making these again. Thanks!! A blender might work but you will need to scrape down the sides. I'd probably just use it to cut the butter into the almond flour. Then add that to the rest of the ingredients in a bowl and mix with a wooden spoon. 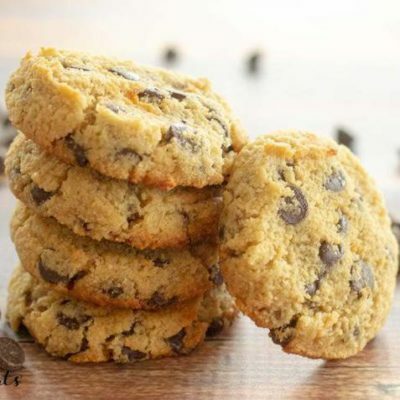 I use flax eggs for chocolate chip cookies are they are delicious!